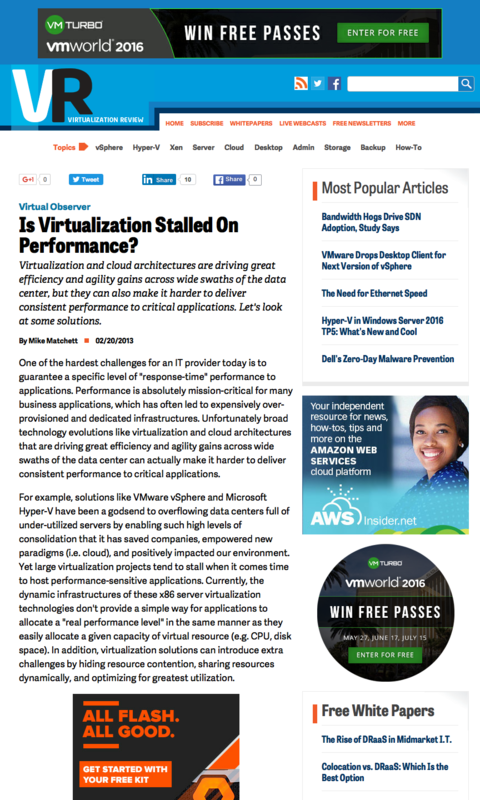 Virtualization and cloud architectures are driving great efficiency and agility gains across wide swaths of the data center, but they can also make it harder to deliver consistent performance to critical applications. Let’s look at some solutions. One of the hardest challenges for an IT provider today is to guarantee a specific level of “response-time” performance to applications. Performance is absolutely mission-critical for many business applications, which has often led to expensively over-provisioned and dedicated infrastructures. Unfortunately broad technology evolutions like virtualization and cloud architectures that are driving great efficiency and agility gains across wide swaths of the data center can actually make it harder to deliver consistent performance to critical applications. For example, solutions like VMware vSphere and Microsoft Hyper-V have been a godsend to overflowing data centers full of under-utilized servers by enabling such high levels of consolidation that it has saved companies, empowered new paradigms (i.e. cloud), and positively impacted our environment. 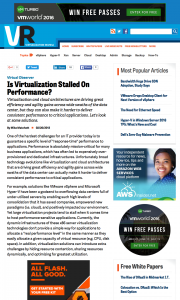 Yet large virtualization projects tend to stall when it comes time to host performance-sensitive applications. Currently, the dynamic infrastructures of these x86 server virtualization technologies don’t provide a simple way for applications to allocate a “real performance level” in the same manner as they easily allocate a given capacity of virtual resource (e.g. CPU, disk space). In addition, virtualization solutions can introduce extra challenges by hiding resource contention, sharing resources dynamically, and optimizing for greatest utilization. This entry was posted in Published Articles and tagged Performance, Performance Management, Taneja Group, Virtualization, Virtualization Review by Mike. Bookmark the permalink.